As a former football player and coach, I can tell you that one of the most important aspects of the game is tackling. It is also the hardest skill to teach because it is hard to practice. From a coaching standpoint, teaching players how to tackle properly has less to do with making them more effective at their position – it has to do with teaching players how to tackle without hurting themselves. That being said, Having players repeatedly hit each other on the practice field is a rough way to learn a critical skill of the game. Engineers at Dartmouth college have answered that question with their “Mobile Virtual Player” or MVP. 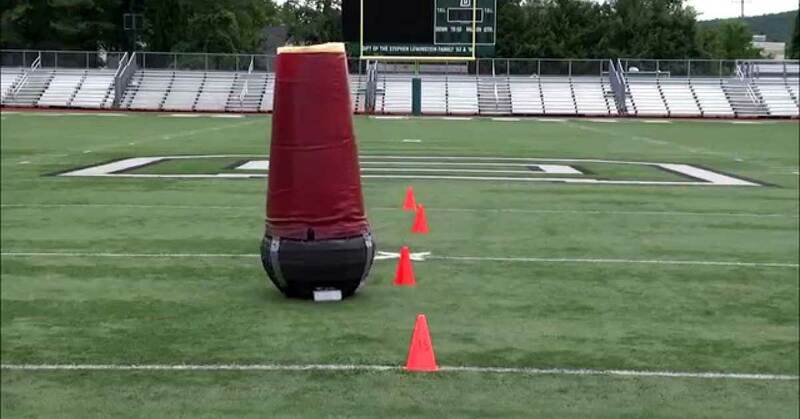 This 5’11” 200+ mobile tackling dummy can be remotely controlled to simulate an opponent – and the best part is that you can’t hurt it. Dartmouth has been an innovator in the past when it comes to tackling drills in practice. 5 years ago their head coach, Buddy Teevens implemented a no-tackling policy in Dartmouth’s practices, which is still the only known program in place in Division I college football. Teevens said, “To my knowledge, no one else does it at the Division I level.